DUET Group has completed the internalization of its management. As part of this process, AMPCI Macquarie Management No.1 Limited (RE1) has changed its name to DUET Management Company 1 Limited and AMPCI Macquarie Management No.2 Limited (RE2) has changed its name to DUET Management Company 2 Limited. Doug Halley is the independent chairman of the boards of RE1, RE2 and DIHL (DUET Investment Holdings Limited). Phil Garling has resigned from the boards of the three entities. Scott Davies has been appointed a director of RE2, with an anticipated retirement date of 30 June 2013. Sims Metal Management has sold its Arizona scrap metal recycling assets, while its Sims Recycling Solutions (SRS) division has acquired the assets of Canadian electronics recycler Genesis Recycling Ltd. Founded in 1994, Genesis is located in Langley outside of Vancouver and provides recycling services to business, government and industrial customers in British Columbia. Genesis deals with electronics and small appliances. It holds ISO 9001, ISO 14001, OHSAS 18001 and Responsible Recycling (R2) Practices certifications, and has expertise with environmentally sensitive materials. The cost of the transaction was not disclosed but is not material. SimsMMs Arizona scrap metal recycling assets were sold to SA Recycling LLC (SAR), a joint venture owned equally by SimsMM and Adams Steel. It has operations in California, Nevada and Arizona. The sale price was US$35 million in cash. The sale was principally the real property related assets for two scrap metal recycling facilities in Phoenix and Tucson, Arizona. SimsMM retains the working capital assets of the Arizona business which it anticipates will monetize another US$15 million in cash over 45 days following the sale. This would bring the total expected cash from the sale to US$50 million. The transaction will be accounted for in the first half of 2012-13 and the result is an expected pre tax loss of $12 million. The loss relates to the value of intangible assets not realized in the sale. Group chief executive officer Daniel Dienst said The sale of our Arizona assets, following on the heels of our recent dispositions of our Colorado assets, our joint venture interest in Nashville and the acquisitions of assets and businesses in Alabama and Maryland over the past few months, is part of our aggressive repositioning of our shareholders precious capital to markets that offer the highest returns on invested capital and meet the long term strategic growth plans we have for the important North American market. Aspen Parks Property Fund has resumed an active development program at its holiday resorts following a pause since the GFC. The Fund is building 38 cabins at its Perth Vineyards Holiday Park to capture more of the family, conference and wedding markets. It is also expanding the number and quality of its cabins at Ashley Gardens in Melbourne. At Boathaven at Albury-Wodonga it is installing seven new tourist cabins. It is raising the standard of accommodation at the Myall Grove Holiday Park at Roxby Downs in South Australia, adding 32 rooms, and is looking to expand the village to three to four hectares in size. At Maiden's Inn at Moama in NSW it is improving the infrastructure, adding new cabins, and moving 24 cabins from the back of the park onto the Murray River frontage where they can command better prices. In addition to these improvements, it is looking to invest another $10-15 million in developments this financial year. Chief executive, Lino Brolese, also told the Fund's annual general meeting that the Fund is very conscious of environmental and sustainability aspects such as saving water and energy. The fund has low debt and continues to look for acquisitions of between $5 million and $20 million each, particularly in southern Queensland, northern NSW and south west WA. Carbon Polymers has appointed David Jacobs as chief financial officer. Mr Jacobs is a certified practising accountant and a member of both the Australian Society of CPAs and Australian Society of Accountants. He has over 40 years of experience. Davids expertise is in a wide range of administration, management and financial functions, designing organizational systems, financial accounting functions and general administration across a range of industries and services, said managing director, Andrew Howard. Steven Kritzler has reduced his interest in Nanosonics from 11.4 to 7.5 per cent. Phoslock Europe has appointed Cimera Estudios Aplicados S.L. of Madrid as its marketing representative in Spain. Cimera is a private limnological consultancy with over 10 years of experience in the evaluation, control and monitoring of aquatic systems. Po Valley Energy has raised $1.35 million through a placement at 12 cents per share. 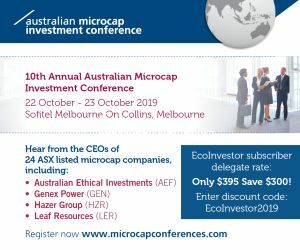 The placement was to several Australian institutional and sophisticated investors and to several of its non executive directors, which needs shareholder approval. Vmoto said production of electric scooters for PowerEagle is on track for 6,000 units by the end of 2012, and at the end of November it had delivered 2,869 of the units. The company has commenced distribution trials of its electric scooters with groups in Israel, Lebanon and Germany. Samples are en route to the distributors. Decisions to enter distribution agreements typically take 6 12 months, it said. In Australia the company is in the process of getting compliance approval for its new E Milan, an electric version of its petrol Milan scooter. The approval is expected in the first half of 2013. Orocobre and joint venture partner Toyota Tsusho Corporation have executed the loan documentation for the project financing of Orocobres Olaroz lithium project in northern Argentina. The financing, to be provided by Mizuho Corporate Bank Ltd, is a maximum facility of US$191.9 million. The primary debt facility is US$146.3 million and the additional facility is US$45.6 million. The term is 10 years. The equity for the project by Sales de Jujuy is US$82.8 million, giving a maximum debt to equity ratio of 70/ 30 per cent. The construction cost is US$229.1 million including $22 million for contingencies. BluGlass has received commitments of $2.35 million for a placement at 20 cents per share, and will offer a share purchase plan at the same price. Co-founder of Dyesol Sylvia Tulloch was not re-elected as a director at the companys annual general meeting on 30 November. The vote was close with 29,125,256 proxy votes for her re-election and 26,026,936 against. However, there were also 4,270,989 discretionary proxies. The resolution was lost on a show of hands. The chairman exercised his discretion not to call a poll on the basis that all of the discretionary proxy votes were known to be voting against the resolution. Earth Heat Resources shares touched a three year low of 0.2 cents on 3 December. On the same day the company raised $220,000 in a placement to sophisticated investors at 2 cents per share. The placement was managed by DJ Carmichael Pty Ltd and fully subscribed. One free attaching option was issued for every two shares placed, with an exercise price of 0.7 cents each and an expiry date of 31 January 2016. KUTh Energys subsidiary, KUTh Energy (PNG) Ltd (KPNG) has signed agreements formalizing its relationship with Kula Energy Pty Ltd (KULA) for the commercial development of its geothermal interests in Papua New Guinea. KULA will take a 49.8 per cent interest in KPNG for a cash injection and ongoing contributions of working capital and management expertise. KUTh managing director, David McDonald, said The collaboration between KULA and KUTh will be very important to convert the Licence applications that are in place in West New Britain and Fergusson Island. There is no doubt about the valuable background and experience in PNG that the directors of KULA bring to the table and they will contribute significantly as we move through the licence approval, exploration and commercialization phases of this project. In particular KULA principal, Julian Malnic, has a long history in Papua New Guinea and will play an important role in this project. At this stage of the companys evolution it is important that we take on projects and commitments that we think we can add value to, finance and manage with current resources. In PNG, increased mining activity in and around our licence application areas offers us the opportunity to capitalize on future mineral plays and possible large power off take projects. Lithex Resources has provided an update on its Munglinup Graphite Project 100 kilometres west of Esperance in WA. The Munglinup Graphite Project is one of a suite of projects under a Heads of Agreement with Far North Minerals Pty Ltd.
Lithex said preliminary analysis of the acquired electromagnetic (EM) geophysical data covering 65 per cent of the 166 square kilometre project area has identified a number of strong conductors, interpreted to represent graphite rich horizons. In particular, the Munglinup Central tenement exhibits a 3 kilometre strike length of EM anomaly. Two strong lines of evidence indicate that this anomaly may be caused by graphite mineralization, it said. Further analysis of the EM data is being undertaken, and will assist Lithex in the design of the maiden drilling program. Paul McPherson has stepped down as executive chairman of MediVac and has been replaced by Kieran Honour. Mr McPherson moves to a non executive role and will focus on the sale of the Sunnywipes and Diakyne assets. He will also retain responsibility for the sales and marketing of the MetaMizer medical waste system. The management change and a cost cutting program follow the merger with Republica Capital and aim to achieve growth and profitability. Water Resources Group is to supply and operate an Advanced Sea Water Reverse Osmosis (ASWRO) pilot desalination plant for a client in Saudi Arabia. Operating subsidiary, Water Resources International (WRI), has signed a Memorandum of Understanding with Knowledge Industry Company (KIC) of Saudi Arabia to supply desalination plants that will be powered by hybrid wind and solar energy systems. KIC is developing community scale desalinated water supply projects that utilize renewable energy. KIC is funding the installation and commissioning of the first ASWRO plant to secure exclusive commercial supply rights from WRI. The commercial scale pilot plant, expected to be operating in Q3 2013, will demonstrate the economics of WRGs chemical free, low cost modular system powered by wind and solar energy. A Participation and Supply Agreement is due to be finalized by year end. Under this, WRI will manufacture and supply commercial scale ASWRO systems to KIC with production capacities ranging from 20,000 to 40,000 cubic metres per day. These systems can service towns, industries and regional property developments, it said. Revenue will be generated from equipment sales, and from WRI operating and maintaining each ASWRO system for the first three years in exchange for revenue from water sales. WRI will also provide technical and maintenance oversight for another seven years.